Two years ago I had the hankering to invite all the Western WA participants from Youthmark Missions to sort of a reunion and “ReLaunch” into their mission field that is their campus, club, community and church. We rented a coffee house and thought we’d have 50-75 people show up to watch some videos, hear some testimonies and be challenged to “live it out” as they head back to school. Well, it was a success. Nearly 175 people showed up that evening. The idea has now expanded! 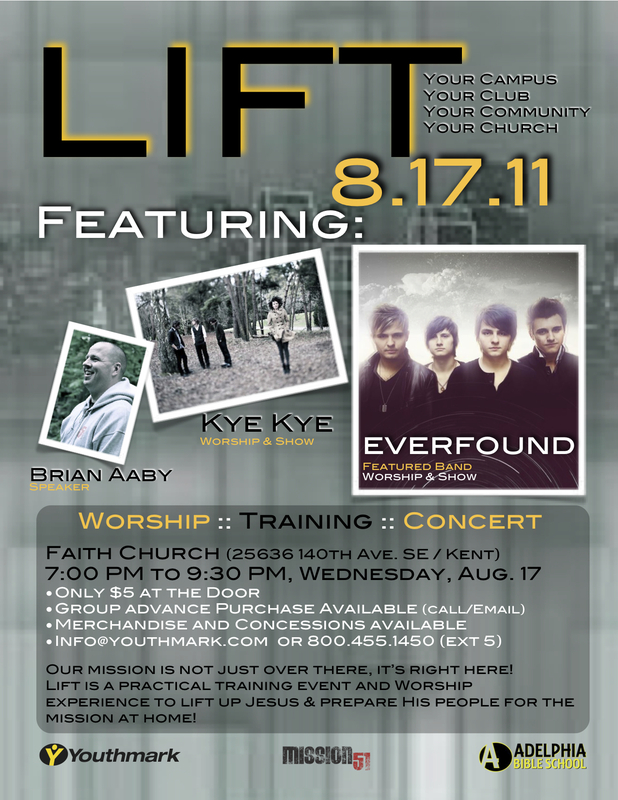 Along with co-sponsor Adelphia Bible School, we are hosting an event entitled “LIFT.” This event will take place on Wednesday, August 17 from 7:00-9:30 pm at Faith Church in Kent. It’ll include an opening concert from Kye Kye (many of you saw them at Creation) and a practical challenge/training session from me (I can’t wait!). In addition LIFT will include a few testimonies, video’s and a closing concert (performance) and worship concert (lifting praise) by Everfound (I’ve spent four weeks over the last two years with these guys, so genuine in their heart for the Lord and passion to serve Him). I’d love it if you could spread the word, I’d love to see the place packed. It only costs $5! Here’s the promo materials. Whether you’re young or old, this event will entertain and equip! Mission51 exists, let’s reach our community now!